Getting more protein may not prevent the loss of muscle mass or strength as we age. Conclusions: These results indicate that amino acid/protein supplements did not increase lean body mass gain and muscle strength significantly more than placebo in a diverse elderly population. This next one was an exhaustive review of 37 studies from January 2000 to October 2013 that addressed the prevalence of sarcopenia and the effect of nutrition and exercise. Up to a third (33%) of adults over 50 (living in the community, not in a care setting where, as you’d expect, the prevalence is higher) have some degree of muscle loss or reduced muscle function. There are quite a few doctors and nutrition coaches advising people to consume more protein as they age to stem loss of muscle mass or strength (sarcopenia). Not only is the jury still out on whether eating more protein will prevent or turn around muscle loss, but it could be harmful. Eating more protein stresses the kidney, and, as we saw, causes detrimental calcium losses, and increases the risks for kidney stones and renal disease. 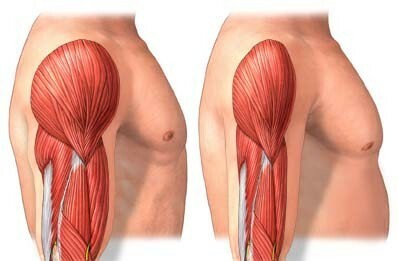 Regarding fat… Insulin resistance and chronic inflammation play a role in muscle loss as we age. Both of those are increased by dietary fat, especially saturated fat. Eat butter? It’s just not a good idea. 1 Compounds In Green Tomatoes And Apple Peels Stimulate Muscle Growth, Protect Against Muscle Wasting (Sarcopenia). This entry was posted in Sarcopenia on October 8, 2014 by Bix. It is ingrained in Americans’ psyche that if you want to build muscle, you have to eat meat. The more meat, the more muscle. It’s in my psyche too, I mean, that’s what I learned growing up. I’ve been spending these last few years undoing it. You can build muscle without eating meat. In fact, eating meat, especially as you age, has more problems than benefits.